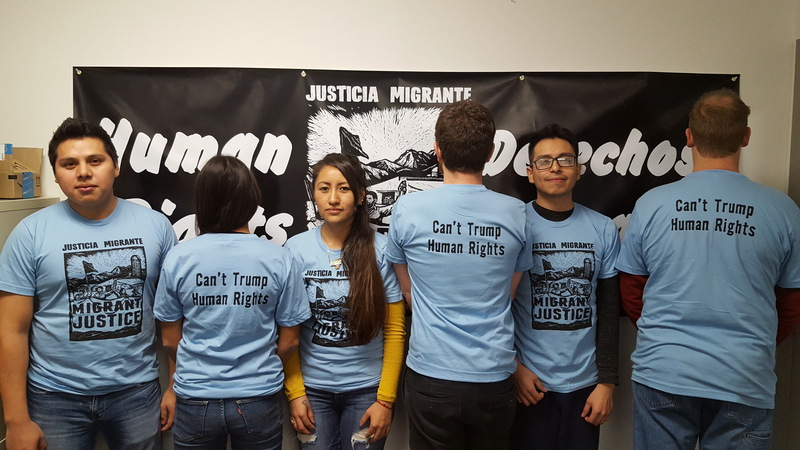 Hot off the presses, wear your resistance and support Migrant Justice with our brand-new "Can't Trump Human Rights" t-shirts! Available in unisex and kid's size tees. Also available are our classic "Milk with Dignity" tees. Need something for a baby shower? Get the Migrant Justice onesie! Baby Blue "Can't Trump Human Rights"
Slate Gray "Milk with Dignity / Leche con Dignidad"
If you are ordering more than one t-shirt and want multiple sizes and/or designs, please indicate here (Trump or Milk with Dignity; Unisex S, M, L, XL, XXL; Kids S, M, L; Onesie).